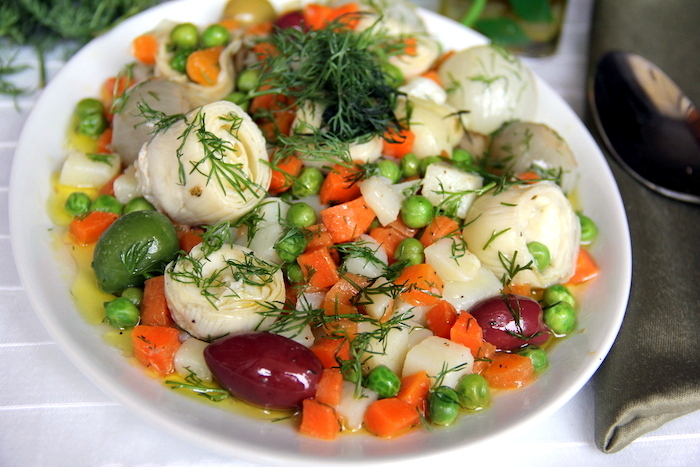 Artichoke is a common ingredient in Turkish cuisine and is available on the streets, pre-peeled and sold floating in water in sealed plastic bags. 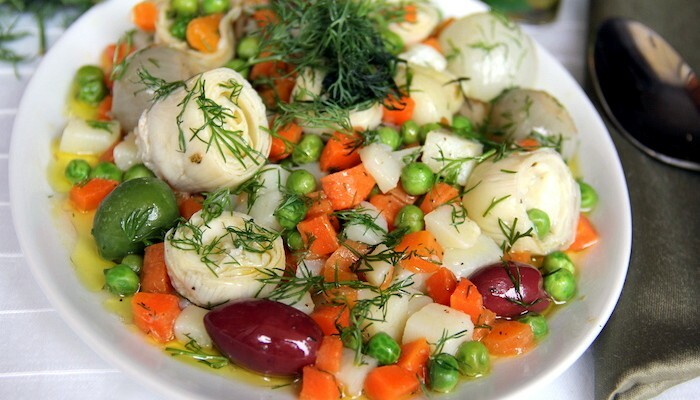 It is served simply, with high quality olive oil, carrots, peas and potatoes. This dish takes that classic pairing and creates a side dish that everyone will enjoy. Artichokes: contain more antioxidants than any other vegetable. They have been shown to kill cancer cells, increase bile flow, re-generate liver tissue, improve digestion and even reduce LDL (bad) cholesterol. 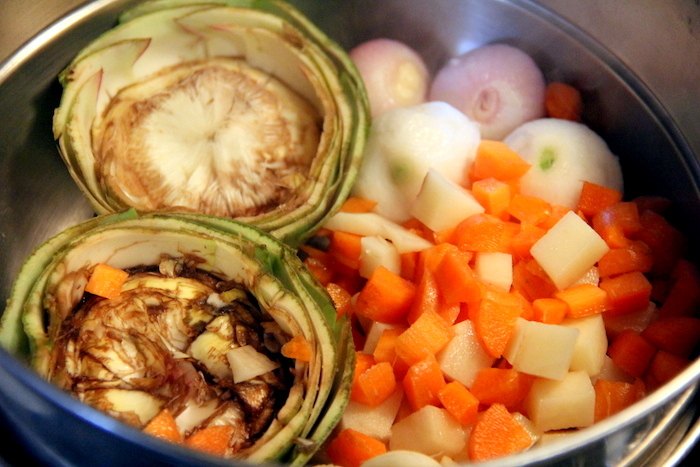 Directions: Skin of the artichokes (learn how to do it here). 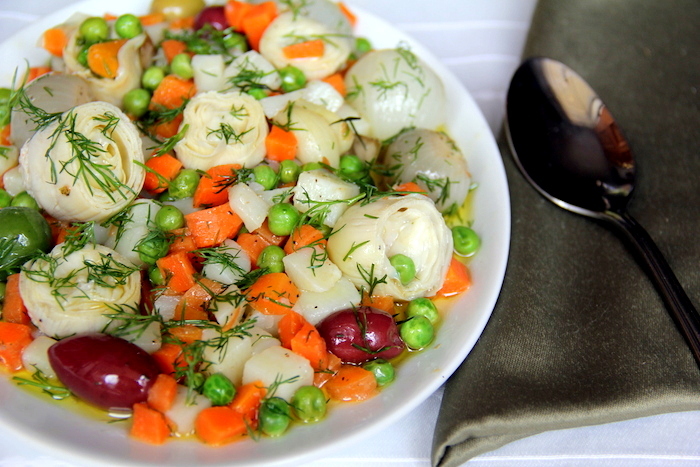 Place the artichokes, potatoes, carrots, pearl onions and peas into a steamer. Steam for 20 minutes and remove all but the artichokes. Let the artichokes steam for longer, another 5-10 minutes, or until soft. 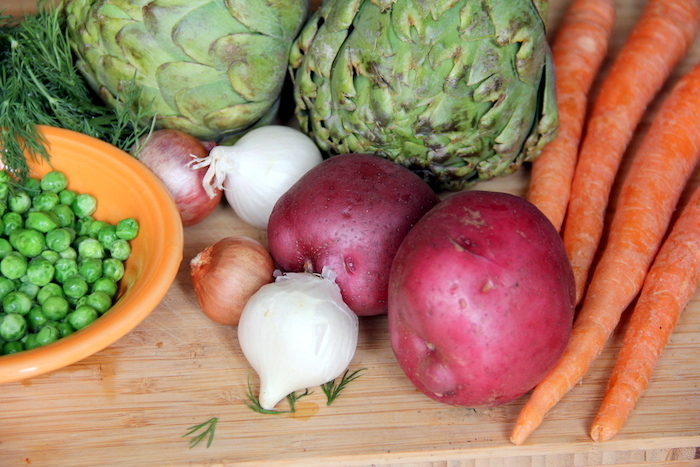 When steamed and tender, add the artichokes (if they are large, chop them roughly) with the remaining steamed veggies to a bowl. Toss in the olive oil and lemon juice. Add the salt, pepper and dill and toss again. 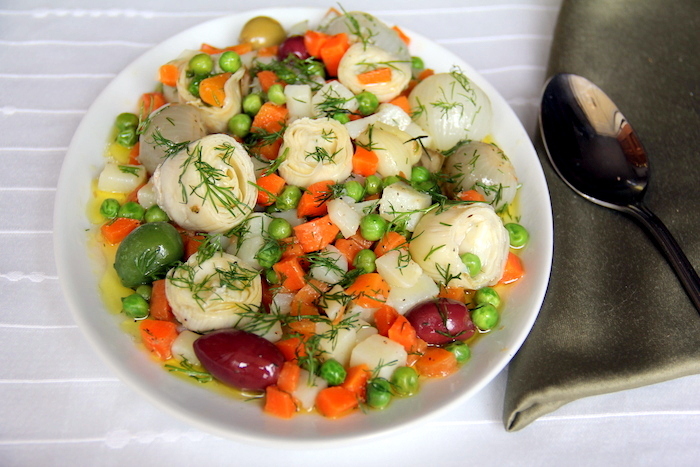 Serve with a few olives atop. This entry was tagged artichoke, artichokes, detox recipes, easy healthy recipes, going vegan, good vegetarian recipes, great vegetarian recipes, healthy, healthy breakfast recipes, healthy dinner recipes, healthy food recipes, healthy meal plans, healthy recipes, heart healthy recipes, how to become a vegetarian, how to eat healthy, mediterranean, quick vegetarian recipes, simple vegetarian recipes, vegan, vegan essentials, vegetarian, veggie recipes, what is a vegan, what is vegan. Bookmark the permalink.